With a hire car we decided to have a look at a Bubble Stove. They are made at Harworth heating near Doncaster. 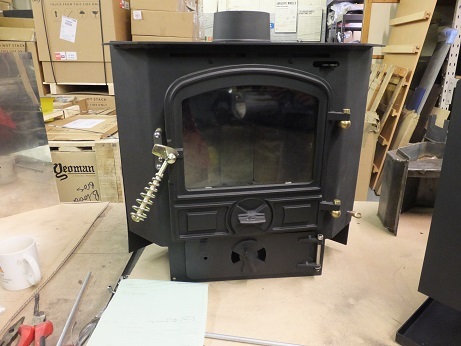 Two stoves were being put together in the workshop that we could look at. Terry was very helpful. 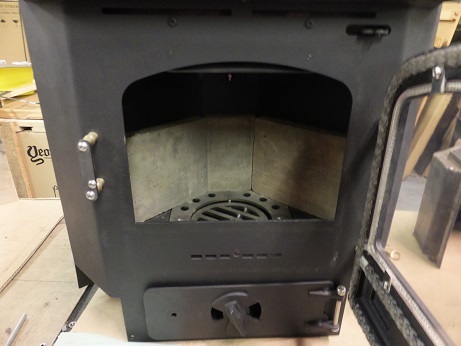 A corner Bubble Stove with a back boiler can be pushed further into a corner of a boat as the back boiler goes around all the back and also extends over the top of the fire box, therefore absorbing much of the heat before it reaches bulkheads. These are built into the stove unlike other brands where they slot into the back. Vermiculite fire bricks surround the fire box, including to the front, where there is a deep lip which should stop hot coals from escaping onto the floor. 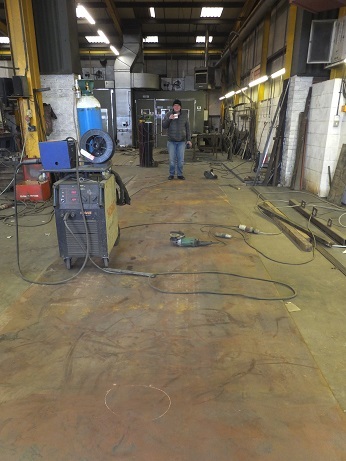 They originally designed the stove for Louis and Josha boat builders in Thorne. 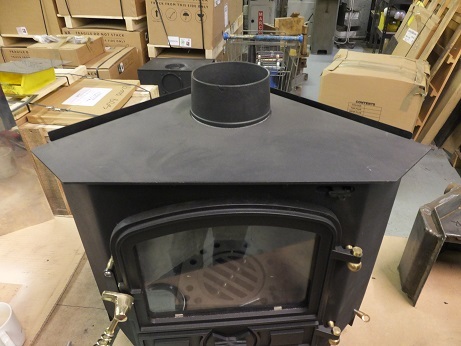 Our problems with selecting a stove for Oleanna have been to do with the amount of space the stove needs, how far the BSS says it has to be from bulkheads, the size of hearth surrounding it, the double skin flue and then the lack of space ontop of the stove for kettle and cooking pots. If your stove is alight it is free cooking heat without extra moisture going into the air that LPG cookers give you. The Bubble has two areas where you can put a kettle, but it seemed to have an up stand around most of the top, which would stop this being possible unless you had small pans. Terry showed us a stove with a cooking rail round it, which would prevent pots sliding off but enable them to overhang the top. We weren’t too keen on that solution as it would be in the way of our bathroom door. We discussed if it was possible not to have a rail at all and Terry said it was and it would not cost any extra, it may even cost less! The problem with the double skin flue, Terry has complained to BSS about it. He believes that a guard instead is a much safer and a better looking option. He showed us one which was quite fancy with fretwork and bits of brass, we’d want a plainer one, which is possible. After turning down the idea of a Bubble Stove with an oven above it, too domineering for Oleanna, we came away quite happy with what we’d seen, only the price tag is quite a bit with a back boiler. Free heat from a stove isn’t quite so free after all! A Josher and Northwich in the background. Then we headed across country to Newcastle under Lyme to Tim Tylers workshop. The industrial estate is the same as many, lots of grey units that all look the same. Lucky for us the front doors were open and the bows of two boats were visible, we were in the right place. The Northwich and Josher were sat in different states of completeness leaving a gap to one side of the workshop. 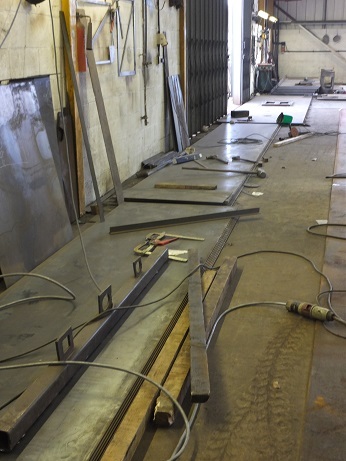 Tim told us that our steel had arrived this morning and the base plate had been laid. 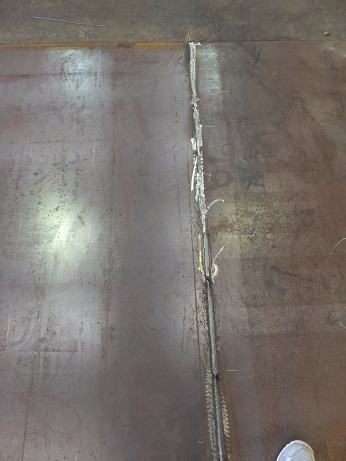 There she was 58ft 6in of 10mm steel on the floor. 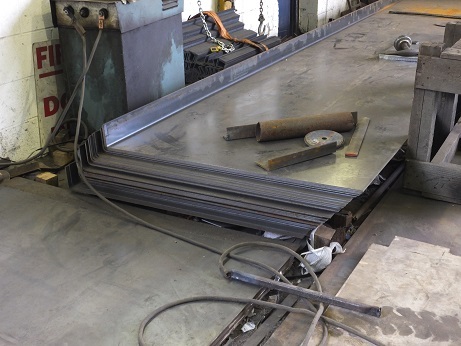 The base plate is made up of two sheets which had already been welded together on the top. 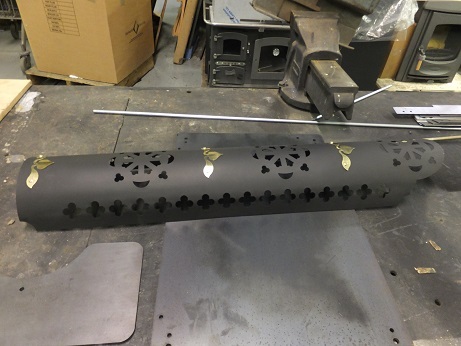 At some point they will be raised off the ground and be welded underneath too, the underside will also receive a coat of blacking as a standard part of the build, not many builders do this. Towards the back of the steel, templates were laid out and the stern curve had been marked out along with the swim. The curve of the swim extends to 13ft from the stern, so a bit further than we’d estimated when at Jonathan’s. We double checked that Tim knew the spec for the hull and he had received my back to front plans. 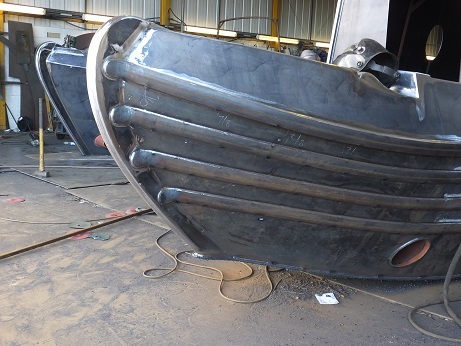 Tim’s workshop will build the majority of the shell leaving window cut outs and bulkheads until it is in Sheffield for finishing. He suggested that the hull would be more or less done in the next two weeks, this is quick compared to most builders, but it is what they do every day, they build a lot of boats! 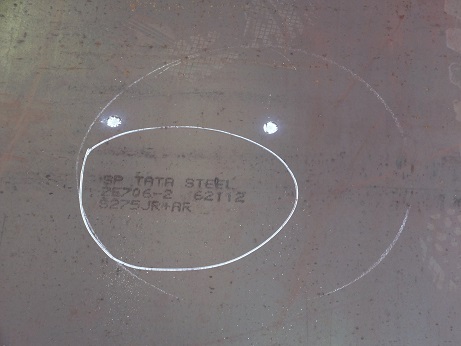 NB Oleanna’s steel has come from Tata Steel and there will be around 10 tonnes in the hull. I doubt our one boat will make much difference to the British steel industry, but it’s a small help. Tyler Wilson gets the baseplate steel milled wider than most builders. 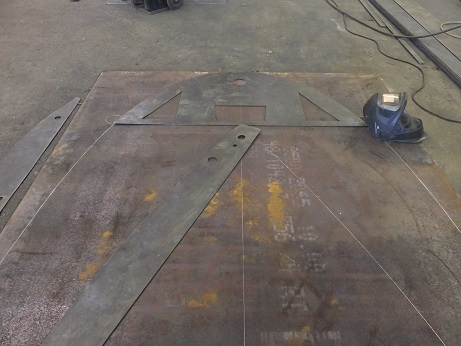 This gives you what is known as a Birmingham square which means that the floor space in the cabin is wider and the sides of the hull can be upright instead of angled. 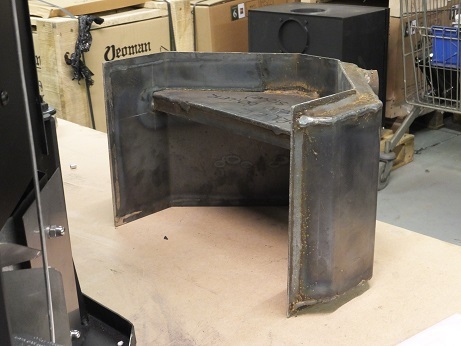 Alongside our hull were stacks of sheet steel for the hull and cabin sides, some had a 90 deg angle already machined into them. Some of these will be Oleanna’s sides. As the workshop carried on being very busy and noisy we chatted with Tim (well shouted at each other over the noise). He will send photos of the construction to keep us upto date with the build as the next time we see her it is likely to be in Sheffield. This entry was posted in Uncategorized on 19th Feb 2016 by pipandmick.